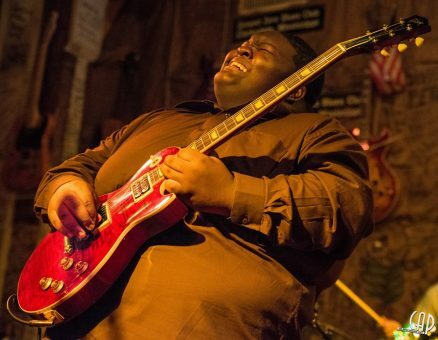 Christone “Kingfish” Ingram’s love of music grew from the rich Gospel sounds emanating from his family’s church and the Blues music he regularly heard played in his Delta neighborhood. A cousin to legendary Country music great, Charlie Pride and trained at the Delta Blues Museum under the tutelage of Richard”Daddy Rich” Crismanand Bill Howl-N-Madd Perry, Kingfish undoubtedly has music in his soul.At the tender age of 6, Kingfish began playing the drums. Three years later, he took up the bass guitar. By the age of 13,he began playing lead guitar. Soon he was fluent in all three instruments and quickly added smooth vocals to his musical repertoire. Kingfish’s guitar influences run the gamut from the Delta Blues of Robert Johnson, Elmore James, Muddy Watersand Lightnin’ Hopkins to the electric Blues of B.B. King, Big Jack Johnson, Lefty Dizz, Albert King and Buddy Guy to the Rock of Jimi Hendrix, Prince and Eddie Hazel. Not only can Kingfish play in the styling of his idols and mentors, but he also has an amazing ability to create guitar sounds entirely his own. Through his young career, Kingfish has shared the stage with legendary names such as Bob Margolin, Eric Gales, Rick Derringer, Guitar Shorty, Buddy Guy and many more. He has played music festivals and venues all over the U.S. and has performed internationally in several countries. He’s been a guest on the Rachael Ray Show and the Steve Harvey Show. Kingfish even performed at The White House for First Lady Michelle Obama. After graduating high school in May 2017, Kingfish is now prepared to release his highly anticipated debut album in early 2018.